If you want your share your installed apps on your android phone to your friend’s android phone then you will need Bluetooth App Sender for Apk share. Bluetooth is a very popular wireless technology that is used to send files and connect to other Bluetooth enabled devices. Bluetooth has wide range of applications too and there are various devices available in market now that can be connected via Bluetooth to your mobile phone or tablet. These devices include Bluetooth speakers, Bluetooth headsets, Bluetooth keyboard etc. But here we talk about the Bluetooth App Sender apps for android devices which are used to take app backup in APK format and send & share the installed apps in your android device to another android device through Bluetooth interface. Let us first know about the various applications of such Bluetooth App Sender apps. APK or Android application package is the installer file for any app or game in android. You can install the app on your android smartphone or tablet by just running or clicking the APK file. Let us now get started with the top rated and top performing Bluetooth App Sender apps that you can download and use for free on Google Play. Here are the best free Bluetooth App Sender Android Apps for sharing or sending app in apk format with other android device. You may find other Bluetooth App Share or APK Share Apps on Google Play but these are the best and reliable ones that work flawlessly with almost any android smartphone or tablet. It is one of the best Bluetooth app sender android apps on Google Play. Using this Bluetooth app you can share the installed apps on your android device with other android devices using Bluetooth technology. 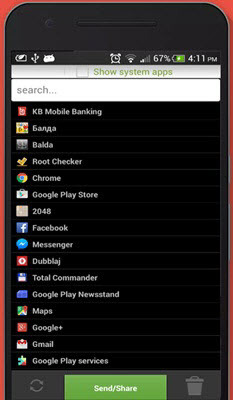 The apps are sent over Bluetooth in APK format to the other android device where you can save and install those apps. The user interface of this Bluetooth app sender app is very simple and the app works very well. You can also share APK or apps on various social networks that include facebook, google+, twitter, gmail or more. Also if you wish then you can send the apps using email too. This Bluetooth sender app also lets you take the backup of your installed apps in APK format on your android smartphone or tablet. It works on almost all android smartphones and tablet which is another great plus point of this app. A very simple to use Bluetooth App Sender or Apk sharing app for android smartphones and tablets. Just select or search app you want to share / send and then send it using Bluetooth, Dropbox, Google+ or Gmail. 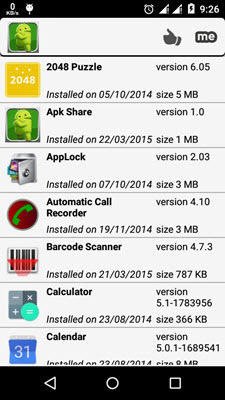 This apk share app also lets you to uninstall or delete the app from your android phone or tablet. This Bluetooth apps sender works with almost all the android smartphones and tablets and you can download it from the link given below. ApkShare is a feature rich and powerful apk sharing app that uses Bluetooth. This Bluetooth app sender app supports multiple languages that include English, Hindi, Simplified Chinese, Traditional Chinese, Arabic. This Bluetooth App Sender android app support many functions that include sending app via Bluetooth / Email, Delete / Uninstall or Install apps, Take Apps backups as APK, sorting of apps, dual SD card android devices and sharing apps through Wi-Fi hotspots. This amazing apk share app is compatible with almost all android versions and devices. Overall a very good Bluetooth apk sharing and backup app that you must definitely try on your android device. A simple and effective Apk share app to send & share apps using Bluetooth. 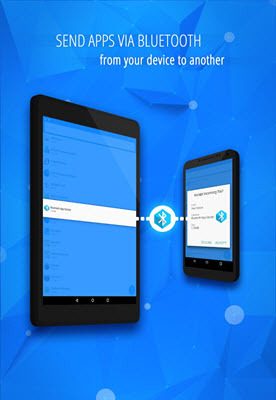 This Bluetooth app sender Android app lets your share and backup apps. You can also share apps on Bluetooth, Dropbox, Google Drive, Gmail etc. Sharek Bluetooth App Sender and APK Share is another very simple and easy to use android app to send and share Apk / Apps with anyone having an android device. You can share the apps installed in your android phone or tablet by sharing the Apk file via Bluetooth or on Email, Wi-Fi, OneDrive or any other sending method supported by your mobile phone. 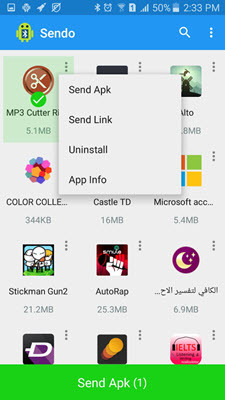 Using Sharek App Sender you can uninstall any unwanted app from your android device and can also run and preview the app before installing it. This Bluetooth sender app is compatible with wide range of android devices and android operating system versions. A simple Bluetooth app sender the can be used to share and send multiple APK files at once. This apk share has other features too that include open an app, uninstall app and backup app to SD card. You can also share the APK via email, facebook, Dropbox, Google Drive etc. Overall a decent Bluetooth app sender that supports many android devices. Another very good Bluetooth app sender to share multiple apps at once. MyAppSharer can share or send app’s APK using Bluetooth, message, Gmail, WhatsApp, facebook, QR-Code, Dropbox etc. You can also take backup of your important apps on the microSD card. This APK share app is compatible with most of the android smartphones and tablets. A tiny, simple to use and effective Bluetooth app share android app. 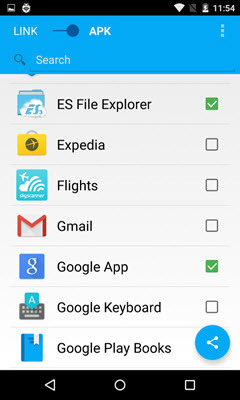 You can extract APK from Apps and share multiple apps at once using this Apk sharing app. You do not have to root your phone for using this app. 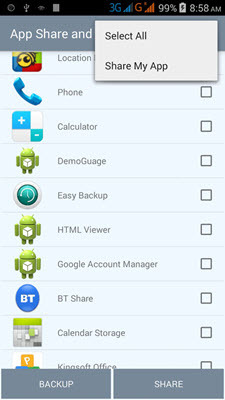 It is also very useful taking backups of the already installed apps on your android smartphone or tablet. Well I have listed the best free Bluetooth App sender apps for Android Smartphones and Tablets. These APK sharing or Bluetooth App Sender Android Apps works very well and does not require you to root your android device. If you have any query or want to suggest other good Bluetooth App Sender app then you can contact us by leaving a comment below. Sir what about Xender and share it. It works very fast via WiFi. Bluetooth is I think outdated technology. 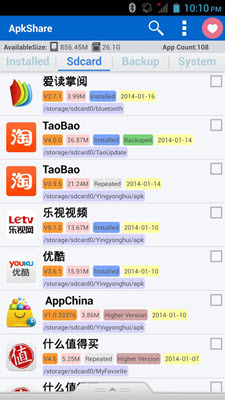 They are more of file sharing apps and I will cover them in a different topic.